Changing Shift, by Edmund Ashe, which depicts weary coal miners leaving a Greensburg mine. 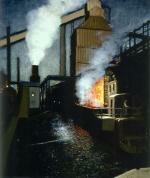 Charging Beehive Coke Oven at Night, by Homer F. Bair, 1937. 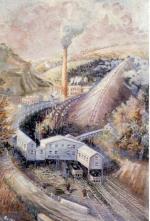 Bituminous Coal Tipple, by Louise Pershing. Beehive Coke Ovens at Night, by Pierre Birckner. Company Row, by Alan Thompson, 1941. Bituminous Coal Plant, by Carrie Patterson, c. 1935. Pittsburgh, by Christian J. Walter, c. 1937. 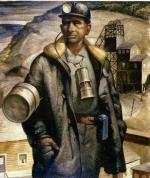 The Miner, by Roy Hilton, c. 1936. 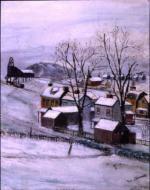 Coal Town, by Thomas J. Armour.